Of the four seasons, winter is definitely my least favorite. The month of December usually goes by pretty quickly with all of the holiday activities, but the rest of the winter always seems to last forever with the frigid temperatures, dingy snow piles, and dark, dreary days. By the time spring finally comes around, I’m always thoroughly tired of constantly shivering, and I’m craving sunlight and warmth. If you live anywhere where the winter season is cold and dark, you probably know exactly what I mean. 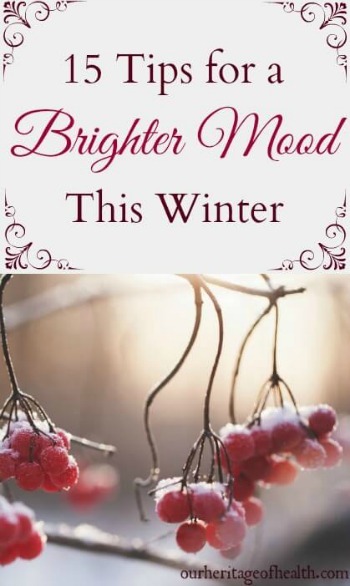 This post is my attempt to find a few positive things about the winter season and to come up with a few strategies for surviving the cold, dark months with a brighter mood. None of these ideas are anything new or special, but they’re the sort of things that we’re the most likely to forget about actually doing when we’re stuck in the winter doldrums. When the thermometer drops below freezing, the absolute last thing I want to do is to get all bundled up and go outside. Staying in bed with warm blankets and a cup of tea sounds about a thousand times more appealing. If I didn’t have a dog to walk, I’d probably hardly ever step outside in the winter time. But as much as I always hate the thought of going outside in the cold, it really does help to spend some time out in the fresh air and the sunlight. Whenever I’m tempted to hibernate, I try to remind myself of how nice and refreshing and invigorating the crisp fresh air will be. With the cold and the snow, most of us tend to be a lot less active during the winter months than we are during the summer. Doing any kind of exercise that you enjoy and that gets you moving can help with the yucky, blah feeling of winter. I’m not into sports at all and you’ll probably never see me at a gym, but I enjoy walking and doing yoga, so I try to make an extra effort to do those regularly during the winter months. It can take more effort to find the beauty in the winter scenery, but it’s still there if you look for it. There might not be colorful flowers or green grass or leaves on the trees, but there’s a unique winter beauty in the silhouette of the bare tree branches against a sunset, or the shimmer of the sunlight on icicles and freshly fallen snow, or the contrast of bright red berries against white. Noticing these small details of beauty can make the drab winter days seem just a little bit brighter. Once the holidays are over and we get past the coldest, darkest Winter Solstice day, I always like to start keeping track of how much lighter it starts getting at night. Sometimes seeing how many minutes of sunlight we’re gaining each day and counting down the days until the clocks change and spring arrives can be a reminder that spring is coming eventually and that winter won’t actually last forever. I also like to order seeds for my garden early, even though I won’t be planting them for a few months, because just looking at the different seed varieties and planning out my garden makes me feel like spring is getting a tiny bit closer. Even though the winter sunshine isn’t nearly as bright or as strong as it is in the warmer months, it always helps just to be out in the sunshine, and the more light we can get during these darker days, the better. And if you hate being cold as much as I do, even sitting by a sunny window can help make your mood seem a little bit brighter. With all the time we spend indoors in the winter time and with how tightly closed up our houses and the buildings we work in can be to keep out the cold, the air we breathe all day long can get that stagnant, almost suffocating feel to it that makes you want get outside (even when it’s 20 degrees out.) And add to that all of the synthetic chemicals in most perfumes, cleaning products, and air fresheners and the quality of the air we breathe can be pretty bad. As much as possible, I try to improve the quality of the air inside by avoiding chemicals, opening windows for a few minutes to let in fresh air, and keeping house plants. Along with improving air quality, houseplants can also be good mood-lifters because seeing something green and growing can bring a tiny glimpse of spring into the summer months. And occasionally splurging on some fresh flowers with their pretty colors and sweet fragrance is another good way to get a quick little mood boost. Eating a healthy diet is important year-round, of course, but it’s especially important during the winter months. When we’re not surrounded by the abundance of all the fresh fruits and vegetables that are in season during the summer and autumn, it’s easier to forget about trying to eat healthy foods and just eat junk instead. During the winter, though, it’s just as important to make sure we’re eating natural, real foods that are nutrient-dense rather than processed foods full of artificial ingredients. It can also help to focus on eating more cooked, warming foods at this time of year like heartier soups and stews and root vegetables rather than raw, cooling foods like salads. It’s also important to make sure you’re getting enough vitamin D, either from foods or from supplements since our bodies aren’t able to make any from the sunshine this time of year. I like to take this extra virgin cod liver oil as an old-fashioned supplement that has vitamin D as well as omega 3s, both of which can help with mood-boosting. Healthy eating doesn’t have to mean you can’t eat anything fun, though. While it’s true that going overboard on sweets might make you feel just as blah as the dark days do, baking up some comfort foods to enjoy in moderation can make the winter season seem a little less dismal. There’s nothing quite like a warm, melty, rich, chocolatety dessert (preferably eaten with a cup of tea while snuggling under a cozy quilt) to give you a break from the cold weather. And if you use natural, real, nutrient-dense ingredients, you don’t even have to feel guilty about indulging once in a while either! Using aromatherapy is a really quick way to give yourself a little mood boost. If you don’t want to take the time to bake something with citrus, or if you don’t have any citrus fruits around, you can get the same mood-brightening effects by using citrus essential oils and making a DIY air freshener or DIY perfume. You can have fun mixing and matching scents like lemon, orange, lime, bergamot, grapefruit, and tangerine and feel a little hint of the summery warmer weather to come. If it’s not possible for you to get away somewhere warm for an actual vacation, you can create a virtual “vacation” escape that you can look at anytime time you want. By creating a Pinterest board and collecting pictures with bright, sunny scenes, or any pictures that make you smile, you can look at that board for a quick break any time you want to imagine you’re someplace sunny and warm. In the days before modern electricity, people more or less went to bed with the sun. Even with candles and lamps, the majority of people in earlier centuries wouldn’t have been able to afford to waste candles or lamp oil by staying up late into the night like many of us do today. In the darker months of winter, the average person would have gotten quite a bit more sleep than we do now. As tempting as it can be to stay up late to get more things done, one of the best things we can do for our moods and for our overall health is to turn off the lights a little bit earlier and enjoy some extra rest during the winter months. I’m terrible about actually following through with this, but this winter one of my goals is to try to be better with going to bed earlier. The winter season was typically a more relaxing season for those living in the past because they were able to have a rest from all of the work of plowing and planting and harvesting on their farms. While there were still plenty of things to do, the winter season meant a time of extra rest while the land was resting too. 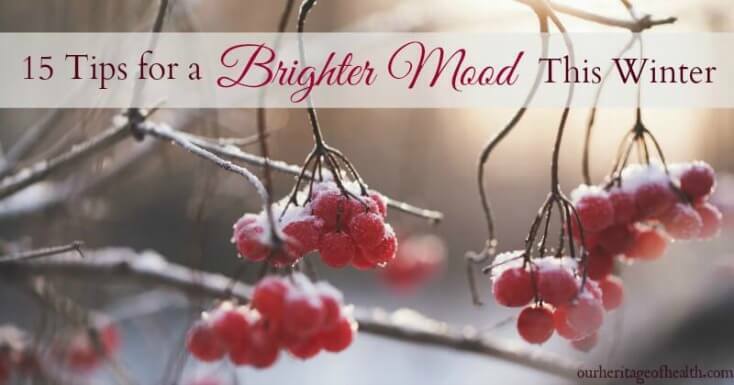 Rather than filling our schedules to the brim with activities, taking advantage of the natural rest cycle of winter and scheduling in a little extra time for relaxation can help us to feel less stressed and to have brighter moods during the winter season. Thanks for an informative and inspiring post, Lori. 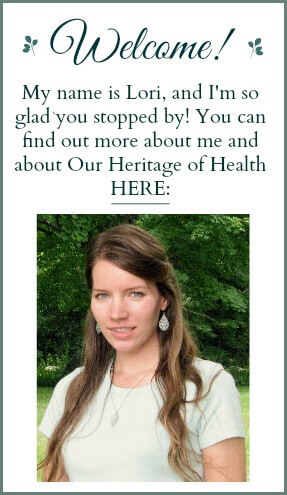 I am new to your blog, and I enjoyed perusing your past articles/posts and other links. Keep up the good work! In this post, I was particularly drawn to #15 (Relax and Lighten Your Schedule). Unfortunately, I am currently in the ‘throes’ of my student teaching practicum, having just wrapped up my Master of Education degree (after ‘retiring’ from a career in banking – and I am not even that old!). However, where there is cold and snow, there are children enjoying themselves, and this winter any hint of winter blues is being thwarted by watching the merriment of the children on the playground (I am teaching 3rd graders). Perhaps I will find my inner Peter Pan yet! Thank you, Brian, and I’m really glad you stopped by and that the post was helpful 🙂 I did a semester of student teaching when I was in college, and I can well remember how incredibly busy and stressful that was! Hopefully you’ll be able to still find a little bit of time for relaxation somewhere in there, and, if not, at least watching the children having fun can help to keep away the winter blues. Good luck with the rest of the semester! Lori, I just love your blog ! So glad I found it as I was looking for a way to dry herbs… Keep up the good work !